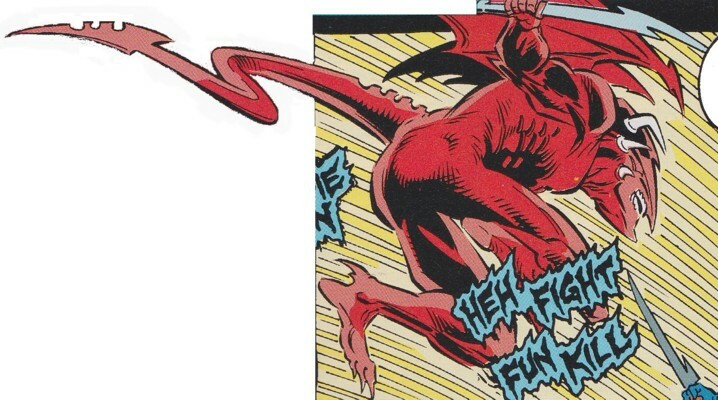 Affiliations: Angela, "Bolt-Face", Department of Occult Armaments, Rene Giscard, "Hairy"
Powers/Abilities: The Taker of Heads presumably possessed enhanced human strength (maybe even superhuman due to his parentage) and wielded a cleaver-like sword. He possessed wings, presumably giving him the ability of flight, green blood, three horns at each side of his head (two of them sometimes disappeared...maybe they could be pulled back in), razor sharp teeth and a carapace on his head. Child-like due to his age he was an expert decapitator. He had memories reaching as far back as his birth. (Midnight Sons Unlimited#2/3 (fb) - BTS) - Jean, the child of a woman from the dictatorship Ile Pabo and a Loa (a voodoo god....actually a lower voodoo spirit), tore his way out of his mother's body when he was born. His sister Angela and Jean were seemingly taken in and raised by Ile Pabo voodoo priest Rene Giscard. Eight-year-old Jean worked as the Taker of Heads for the voodoo priest Rene Giscard. When they moved to a mansion in Boston Giscard sent the Taker of Heads as a patriotic service to Ile Pabo to after fugitives from their island nation. The Taker decapitated them for his master, but after the fifth death Blade took on the case. (Midnight Sons Unlimited#2/3) - When Giscard was hired by Hydra's D.O.A. to kill the Nightstalkers Giscard sent Angela to lure the Nightstalkers' Blade to his hideout. After Blade slew Giscard's henchmen "Bolt-Guy" and "Hairy" Giscard sent the Taker of Heads at Blade. 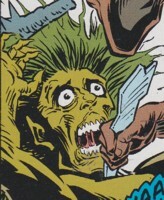 Though Blade drew first blood Taker's sword easily snapped through one of Blade's shortswords. When Blade was going to finish the Taker he was stabbed in the back by Angela, who didn't want her little brother Jean to get hurt by Blade. Giscard explained Jean's origin and why they had lured Blade there. Blade pulled the knife from his shoulder and threw it at the Taker. When it got stuck in Taker's head he jumped at Blade, who kicked him in the gut. Taker accidentally stabbed Giscard through the chest and was then decapitated by Blade with his second shortsword, which Blade had picked up again moments before. Blade left his corpse behind in the burning building and was leaving while firefighters arrived. Comments: Created by Gary Cohn (writer), Kevin Kobasic (pencils) & Brian Garvey (inks). Ile Pabo was probably a French colony at one point. Ile is French for island. Giscard revealed that Jean's father was a voodoo god. 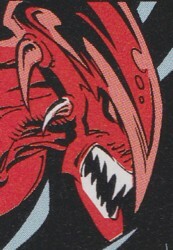 Loa are lower spirits in the Marvel Universe serving the true Vodū gods. They are often the first to be summoned by humans in their rituals. Considering Giscard took in Angela and Jean it is possible that he was the voodoo priest performing the ritual that resulted in the summoning of the Loa that impregnated his later wards' mother. Maybe he is even Angela's true father and therefore Jean's foster father. (Midnight Sons Unlimited#2/3 (fb) - BTS) - Angela hails from the dictactorship Ile Pabo. 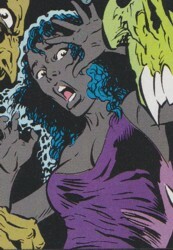 Her mother died when she gave birth to her half-brother Jean, a half-human/Loa hybrid, who tore through his mother's womb. Angela and her brother were seemingly taken in and raised by Ile Pabo voodoo priest Rene Giscard. When Giscard was hired by Hydra's D.O.A. to kill the Nightstalkers he sent Angela to lure Blade to Giscard's mansion. (Midnight Sons Unlimited#2/3) - Blade, unaware it was a staged attack, saved Angela from Giscard's agents "Bolt-Face" and "Hairy" then took her back home when she collapsed. Upon waking up Angela claimed she had been Giscard's slave since she was a child and that Giscard had slain her parents. She asked Blade to aid her in saving her little brother from Giscard. Falling for her Blade followed "Bolt-Face"'s trail when he took Angela back to Giscard's mansion. Arriving there Blade saw Angela chained up, but Blade cut through the chain to free her. Angela turned on Blade and stabbed him in the back with a knife when Blade threatened to kill her brother, the Taker of Heads. Giscard then revealed that he had sent Angela to charm Blade. After Giscard and the Taker of Heads were dead Angela claimed once again that she had been a victim the whole time and that she was now finally free. When Blade turned his back on her she tried to shoot him, but before she could pull the trigger Blade impaled her with his shortsword. Blade left her dying form behind in the burning building while firefighters arrived. 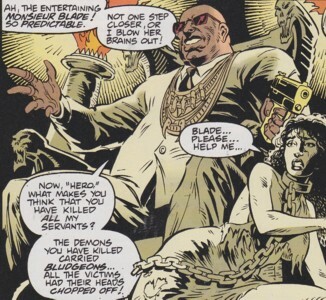 (Midnight Sons Unlimited#2/3 (fb) - BTS) - Rene Giscard was a voodoo priest from the dictatorship island nation Ile Pabo. He was very patriotic and considered it his duty to eliminate all enemies of Ile Pabo. At some point Giscard seemingly took in Angela and her half-brother Jean, a Loa/human hybrid, to raise them. The monstrous Jean eventually became one of Giscard's deadly agents as the Taker of Heads. Giscard sometimes took independent contracts. Giscard took up residence in a mansion on Beacon Hill in Boston started going after immigrants in the area that fled from Ile Pabo. After five former Ile Pabo citzens were killed by Giscard's agents When he was hired by Hydra's D.O.A. to kill the Nightstalkers he decided to go after Blade first. Considering Blade most susceptible to Angela's charms he sent her to lure Blade to him. Giscard sent his agents "Bolt-Face" and "Hairy" to fake an attack on Angela, who was saved by Blade. "Bolt-Face" later returned Angela to Giscard's mansion where Giscard put a dog collar and chain around her. (Midnight Sons Unlimited#2/3) - When Blade arrived, tossing "Bolt-Face"'s head into the room Giscard threatened Angela with a gun to keep Blade at bay and then called for the Taker of Heads. When Blade injured the Taker of Heads Giscard tried to protect his agents by shooting Blade, but Blade was too fast for him and jumped Giscard, who fell to the ground. Blade then destroyed Angela's chain, freeing her only to be stabbed in the back by her when Blade threatened to kill the Taker of Heads, her brother. Giscard then revealed the Taker's origin and how he had been hired by D.O.A. to assassinate Blade. When the Taker jumped at Blade with a deadly attack Blade kicked him in the gut and the Taker accidentally stabbed Giscard through the chest, killing him. Blade left his corpse behind in the burning building and was leaving while firefighters arrived. They were agents of voodoo priest Rene Giscard. They were presumably mutated by Giscard's voodoo magic, but their true nature is unknown (they could've been undead creatures or some other kind of monstrosity). Sent by Giscard they faked an attack on Angela and were defeated by Blade, who broke "Bolt-Face"' lower jaw and tossed "Hairy" into a burning barrel. The agents ran away and Blade took Angela home when she collapsed. They later broke into Blade's apartment to take Angela back to Giscard's mansion. "Hairy" got decapitated by Blade with a glass shard from the broken shower window. At Giscard's mansion "Bolt-Face" attacked Blade and was cut in two by him before Blade decapitated him as well and tossed "Bolt-Face"'s head in front of Giscard.